to bring every pilgrim to their knees. Our Tibetian Guide will come to receive on the airport. Our Guide will give you briefing about tomorrow and also the days in Lhasa. We will Rest for the day in Hotel for acclimatization and walk around the Street enjoying the Tibetian and Chinese culture. Explore Lhasa Full Day: Sightseeing of Jokhang Temple, Sera Monastery and Barkhor Market. 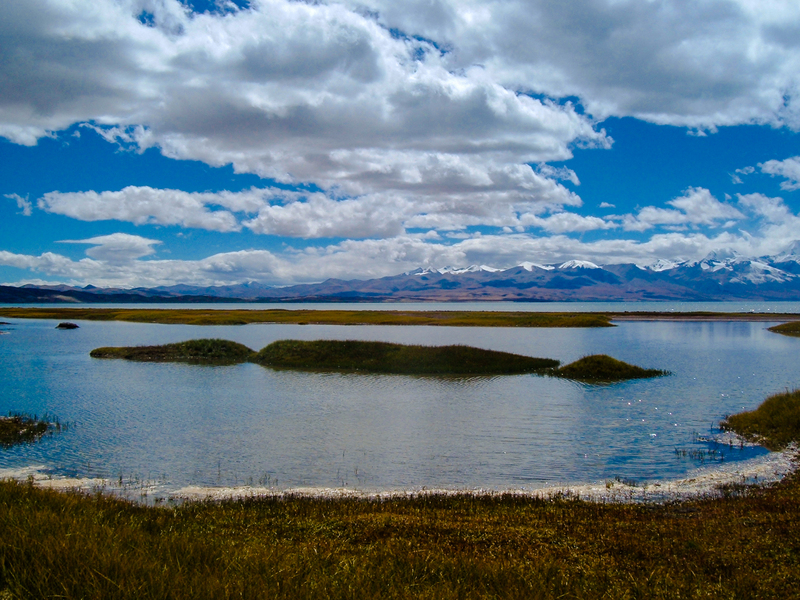 Our Guide will take us to explore some of the scenic beauty of Lhasa. Including Bharkhor Square which is popular devotional circumambulation for pilgrims and locals. The walk around Bharkhor Square is about 1 Km long; And then Sera Monastery which is one of the three Gelug University Monastery. Purification ceremony with lamas. Visit monks debating in debate courtyard. Second day Explore Lhasa: Sightseeing of Potala Palace & Drepung Monastery. Potala Palce is chief residence of the Dalai Lama until the 14th dalai lama fled to india during 1959 Tibetan uprising. It is now a museum & World Heritage Site. The construction of Potala Palce was started in 1645 A.D. by 5th Dalai Lama. And the Drepung is the Thirf University Monastery of Tibet. It was the largest monastery in the world at that time which housed 7,700 monks but some time 10,000 monks, founded by jamyang Choqe tashi Palden (1397-1449) in 1416 A.D.
Lhasa- Yamdrok-Tso lake and Ghyantse 260 km(B): In the morning, drive from Lhasa to Gyantse .On the way, drive over the Gampala pass (4790 m), and you will have a glimpse of Yamdrok-tso (4400m) .The Lake is surrounded by many snow-capped mountains and in the distance you can have spectacular views of Holy Mount Nyenchen Khangsar, (7191m) the highest mountain near Lhasa . Shigatse to Saga (320 km – 8 Hours) 4450m: It is long driving through high passes on the way. Time to time stop at view point of Himalaya and beautiful Lakes. Enjoy the view of snow capped mountains; magnificent view of high Himalayas can be seen such as Gaurishanker, Shishapangma, and Langtang Himal. We will be crossing the holy river Bhramaputra. Exploration around and drive to Darchen 4575 (40km – 1 hour). Overnight at Guest house: Have enough time to exploration around Lake Mansarovar. Get morning view of lake with sunrise. You will spend more than half day and drive to Darchen for overnight. Bath with Mansarovar water is preferable with most of the pilgrimage. Puja or hawan at bank of the lake, exploration of hot spring near from chiu Gumpa. Overnight at guest house. 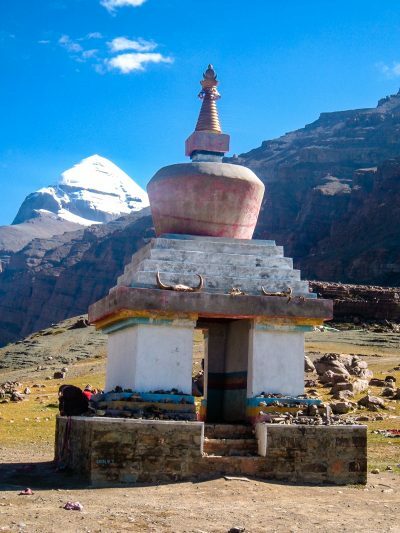 Drive to valley of the God and start Kailash kora: Reach Dirapuk (18km – 7 Hours) 4900m. Overnight at guest houseWe start early drive from Darchen after your breakfast. Our staff will provide you packed lunch for on the way. Drive to valley of the god which is also called Yamadwar. Start walking towards Derapuk. Walking trail is flat land and some minor up hills. Reach at Dehrapuk and have north face of mount Kailash. overnight at guest house. Drive back to Shigatse: Overnight at HotelWe drive back same way to Shigatse. If we have not visited Tashilampo Monastery before, chance again to reach there. Drive back to Lhasa: Overnight at Hotel Same way back to Lhasa. Come and hear about this once in a life-time opportunity! For entry to Tibet we need a scanned copy of your passport as well as China visa. This visa can be obtained in New Zealand. The Tibet travel permits will be sent to the group leader by post. The original copy of permits will need to be collected in China so a one night stay enroute is required. For Savitri, meditation at the holy mountains of India and Tibet, have been a life-changing experience. The deep transformation that is possible in places where the divine realms interface with the physical, has inspired her to share these experiences with small groups of pilgrims. She has been travelling to the Himalayas for over 18 years, living in a cave in the high mountains among saints and yogis. 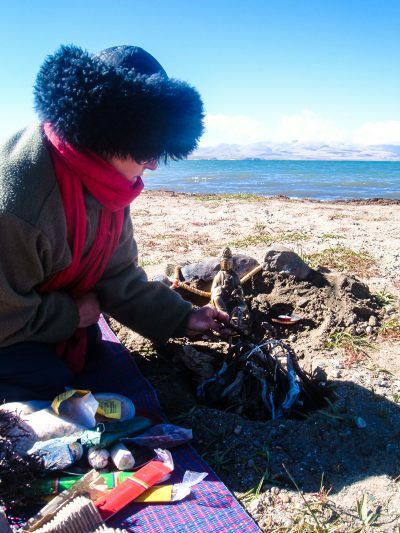 Sent by the brother of Kailash, Shivaling, in 2007, she led her first group to this sacred place. She knew she would return.